ConnectPV 1500V Combiner Box products are based on a core product architecture optimized for DG and utility scale solar projects, simplifying project design and specification. 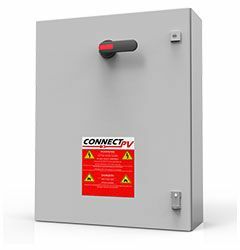 ConnectPV 1500V Combiner Boxes incorporate “best-in-class” components combined with rugged mechanical designs to maximize reliability over the projected life of the project. • Upsized Disconnects at 1.56x Sum(Isc) for Inverter OCPD coordination.